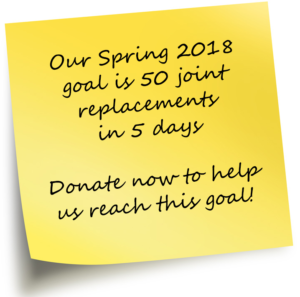 Imagine living your life with severe pain of crippling arthritis and looking at a future that holds no hope of relief, because there is no access to quality health care and no money to pay for joint replacement surgery. Download the donation form OR donate online. Your online donation will be securely processed through PayPal. You can pay with any major credit card or with your PayPal account. Operation Walk Idaho is a 501(c)(3) nonprofit, so all donations are tax deductible. Receipts are sent for all donations. On behalf of the clients, families, board, volunteers, and staff, we THANK YOU for your support.